Derby 133 is made from a pale grey material with black button eyes and a white “star” patch on his face. His mane and tail are made from a fluffy black material. He wears a pale blue and brown saddle pad with the Kentucky Derby 133 logo on it. Just can’t wait to see who’ll win! Derby 133 was released on 12th January 2007. His birthday is on 5th May 2007. 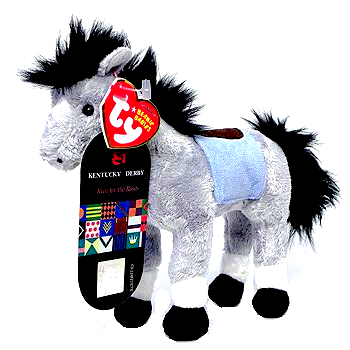 This is the Kentucky Derby store version of Derby 133 with an exclusive swing tag. There was also a retail version. Both versions have the same style number. There is also a Churchill Downs store exclusive version with a special swing tag. This version had a different style number than the other two versions.